Tiny Houses are primary, full-fledged dwelling units on a small scale. Building and living in a Tiny House is done from a conscious choice, as an answer to a desire to live a simple life. With less focus on material possessions and with a smaller eco footprint. Clever ways of utilizing space and the use of innovative technologies are characteristic in the design and construction of Tiny Houses. A Tiny House is up to 50 m2, ideally (partly) self-sufficient, of high quality and functioning as a fulltime inhabited dwelling. Being mobile and/or fully off-grid is a possibility, not a requirement. Besides Tiny House, sometimes the terms ‘Micro House’ and ‘Small House’ are also being used. A Micro Home is an even smaller, mobile dwelling unit that is very suitable for travel, for example for digital nomads A Tiny House on wheels (THOW) can be moved, but is usually not build to travel around with. A small house is bigger than a Tiny House and is often built on a foundation. The Tiny House ‘movement’ as we know it originated in the United States, as an answer to a series of events that shook the housing market. A collapsing economy and disasters like hurricane Katrina caused people to lose their homes and young people found it increasingly difficult to obtain a house. As the need for affordable and flexible housing grew, some people started building their own little houses. Jay Shafer and Dee Williams among others, became pioneers in the Tiny House movement. To bypass limiting regulations that dictate minimum measurements of dwelling units, these pioneers build their home on a trailer, thus starting an interesting movement with a beautiful philosophy: the Tiny House movement. These days the popularity of Tiny Houses has grown to sizable numbers. You can find hundreds of books, blogs, television series like Tiny House Nation. Around 40.000 people visited the first Tiny House Jamboree in 2015. As is often the case, the rest of the world is following and now also in Europe builders and enthusiasts are popping up everywhere. The average size of our homes has increased in the last 50 years, though families have become smaller. Not only our houses have become bigger, the amount of material possessions we gather are increasing under the influence of commerce. You should have a luxury automobile, a walk-in closet full of exclusive clothing, the latest gadgets, otherwise you don’t fit in. We are in the middle of a turning point. People are starting to realize that all this excess space and stuff are not making us any happier and many got into financial trouble, trying to achieve that standard of living. The Tiny House movement offers an answer to the desire to live a more simple life and to live in a way that doesn’t impact the Earth as much. You can take your home with you when you move. If you take a job elsewhere, or if you get tired of looking at the same surroundings every day, you hook up your house to your vehicle and move. That kind of freedom has a great appeal to many people. Some people want to see the world, travel as much as they can but still have a place to call home and return to without having to worry about housing costs. Some people choose a Tiny House because they realise that the modern-day standard of living does not express who they are, it causes a conflict of values. They want to live fewer material possessions, to lead a simple life with a focus onthat which is really important. Fewer distractions, more conscious living and living your dreams and passions. More and more people are starting to wake up and realise that we can’t continue to treat the planet as poorly as we have been doing. The enormously negative impact that our society, that is focused on endless growth, is having on the environment is undeniable. People want a change, want to contribute to the movement that will turn the tide. By living as sustainably as they can and reducing their carbon footprint, they set a positive example and educate others. Living in a Tiny House is a perfect fit. Some say that the building site of a regular house produces two Tiny Houses worth of waste materials. In any case, by living in a Tiny House you produce less waste and use less energy and water then you would in a regular house. Tiny Houses speak to the imagination of a lot of different people, because they are so well made. Craftsmanship, an eye for detail, much care and attention are all put into the design. People are building these houses or are having them built tailored to their wishes, not with the sales value in mind but with the aim of having the best living experience possible. In the regular housing market a nice design is often of less importance than the sellable amount of square footage. Choices are therefore based on the latter, consequently you are living in a slab of concrete. You can create your Tiny House in such a way that it expresses who you are. 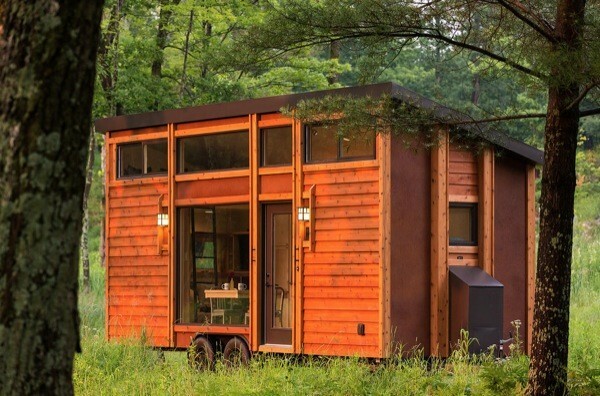 Because Tiny Houses are often built by their owners or by small companies, a lot of thought and craftsmanship is put into the design and creation of the homes. If you are going to live in it yourself, you want your home to be exactly as you wish and want it to be safe to live in. For a small company, a high-quality product is the best promotion. In a small community, the best PR is word to mouth. 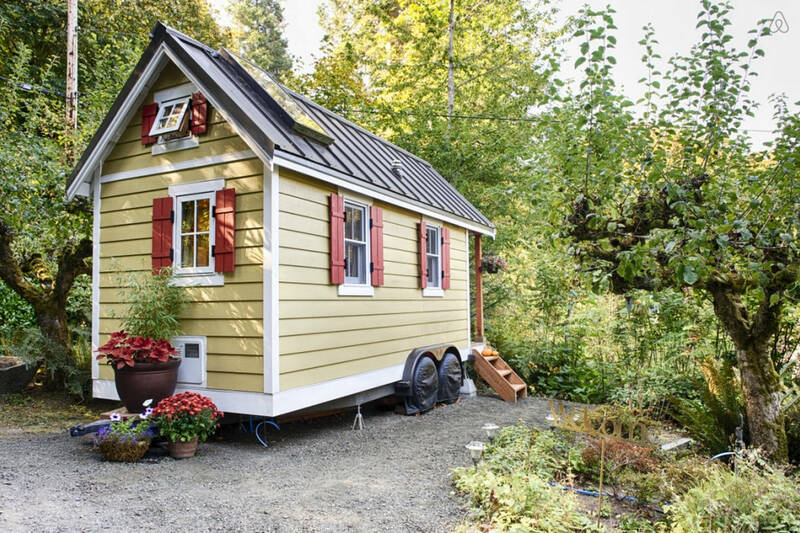 Whether you save up the money or get a loan, you can own a Tiny House and be debt free within years. On average, regular home owners spent 25 to 50 percent of their income on housing costs. A Tiny House owner can use that part of their budget for other expenses. The amount of water, electricity and gas that is used in a Tiny House is much lower than in a regular House. Besides that, many Tiny Houses are equipped to generate their own energy, for example by making use of solar panels and batteries, which reduce the costs even more. You don’t have a lot of room for stuff in a Tiny House, as a consequence you have to make conscious decisions when buying something new. 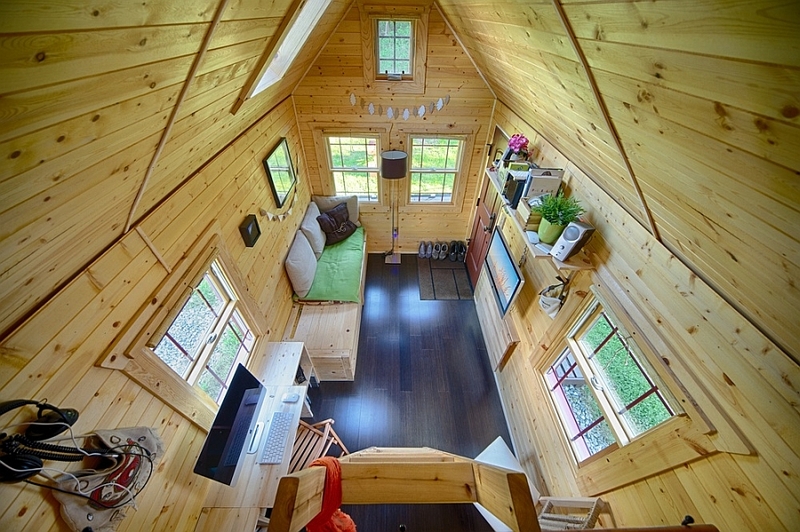 On average Tiny House people consume less than people living in larger homes. By reducing your housing costs you have the option of working a day or two less, or taking some time off to go travel the world. You have more time to visit friends and relatives. Also, cleaning and maintenance of your house doesn’t take much time. The simplicity of living Tiny creates room in your life to focus on that which is important to you. Everything has its place, you don’t have room to make a mess. To live in a Tiny House often means that you spend more time outdoors than you would in a regular house. If you don’t have a washing machine, you will have to take the laundry elsewhere. If you don’t have Wi-Fi, you might want to visit the library or a café to get your email. For some people this is a benefit of living Tiny. Living in a Tiny village, it is easier to connect with your neighbours. To share time and possessions, help each other out in times of need. Many people are longing for more sense of community. Often it is a combination of the above-mentioned reasons, that makes people go for the Tiny lifestyle. What’s holding people back is a fear of the unknown, the restrictive legislation, the question whether or not it is ‘doable’. But, as president Roosevelt once said: ‘we have nothing to fear but fear itself’. If nothing else, the experiences of members of the Tiny House movement are mostly very positive!